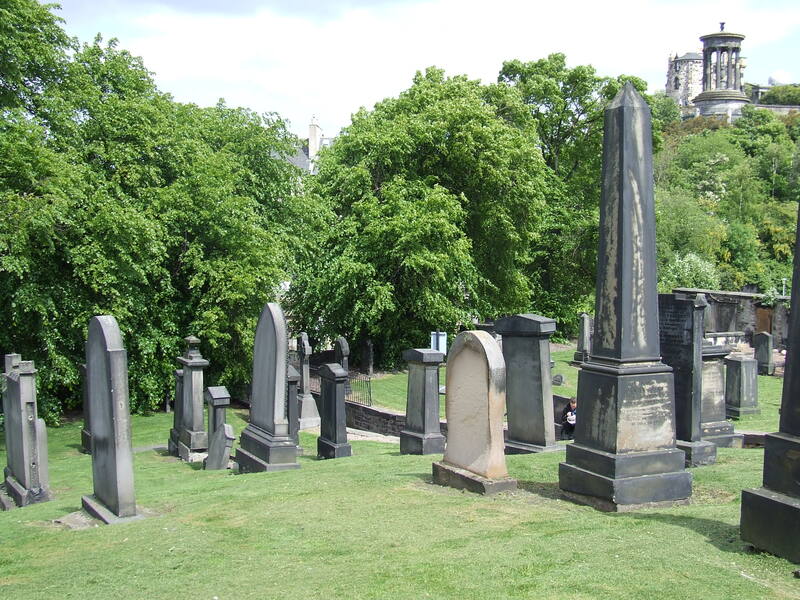 On a recent trip to Edinburgh I took the opportunity to visit an unusual monument in one of the Scottish capital’s picturesque burial grounds. 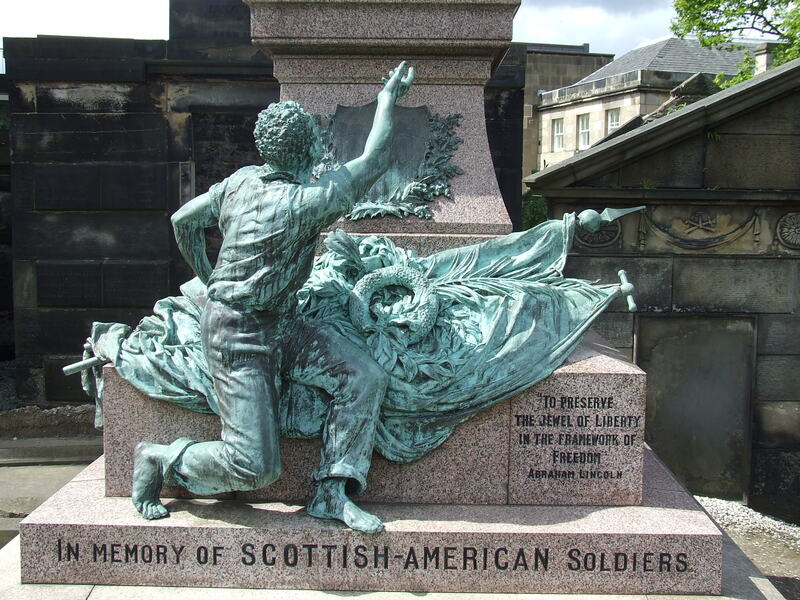 Within Old Calton Cemetery is a memorial to those Scots who served the Union cause- the only American Civil War memorial outside the United States. The cemetery is positioned in a dominant location overlooking the city centre, and the memorial itself is prominent and imposing. 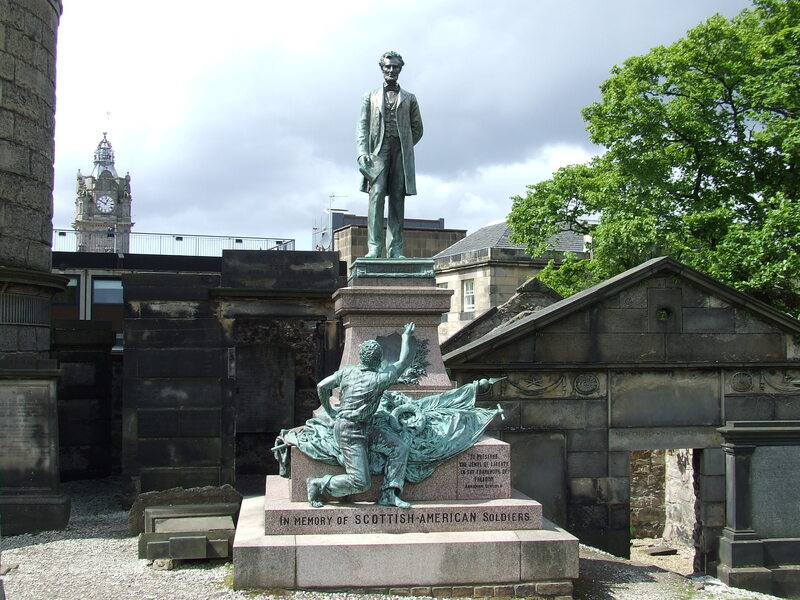 Emancipation is its central theme- Abraham Lincoln is portrayed atop a plinth, with an emancipated slave below him raising an outstretched hand. On each of the four sides is inscribed ‘Suffrage’, ‘Union’,’Education’ and ‘Emancipation’. The names of a number of Scottish Union soldiers are also commemorated on the monument. 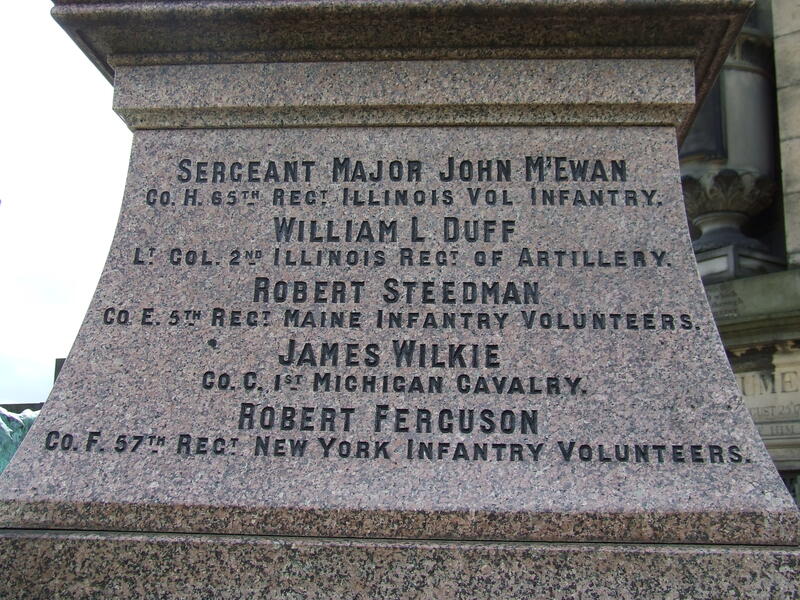 These are Sergeant-Major John McEwan of the 65th Illinois, Lieutenant-Colonel William L. Duff of the 2nd Illinois, Robert Steedman of the 5th Maine, James Wilkie of the 1st Michigan Cavalry, Robert Ferguson of the 57th New York and Alexander Smith of the 66th New York. The memorial was dedicated in 1893, and although very much a product of its time it remains a poignant symbol of Scottish involvement with the Union cause. The story behind its creation is a moving one, involving the widow of Sergeant-Major McEwan. The details have been researched by The American Civil War Round Table UK and can be read here. Ireland still does not have a memorial to soldiers and civilians from the island who were caught up in events, North and South, between 1861 and 1865. It is to be hoped that this will be rectified during the period of the 150th anniversary of the conflict. Well done, Damien, for bringing this to our attention, and well done the Scots, too, for commemorating their soldiers. You have already noted Waterford’s substantial monument to Captain Patrick Clooney of the 88th New York, Irish Brigade, and I suppose there is nothing else quite matching it elsewhere in Ireland. 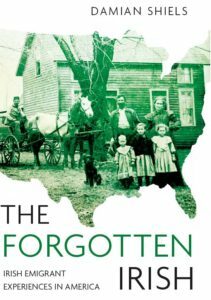 But a monument to all those Irish men and women who participated in the American Civil War is something we should be planning for, and I shall be among those who support such an effort. Many thanks for your kind words- there are a few monuments dotted around the place, but no over-arching one, which given the number of Irish involved and affected I think is warranted. A number of us are hoping to get something off the ground with regard to this- if you are interested I can send you on some details regarding it. Yes, Damien, I’d be interested in getting any info on plans for a monument.